Our third morning in Oaxaca, we piled into a van for the short drive to Monte Albán. 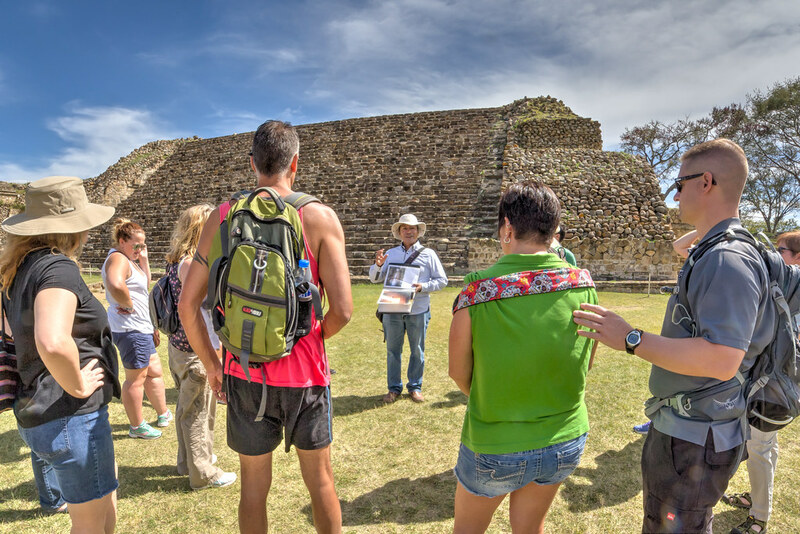 The “white mountain” was a major settlement and ritual center of the Zapotec culture and one of the biggest archaeological sites in Mexico. 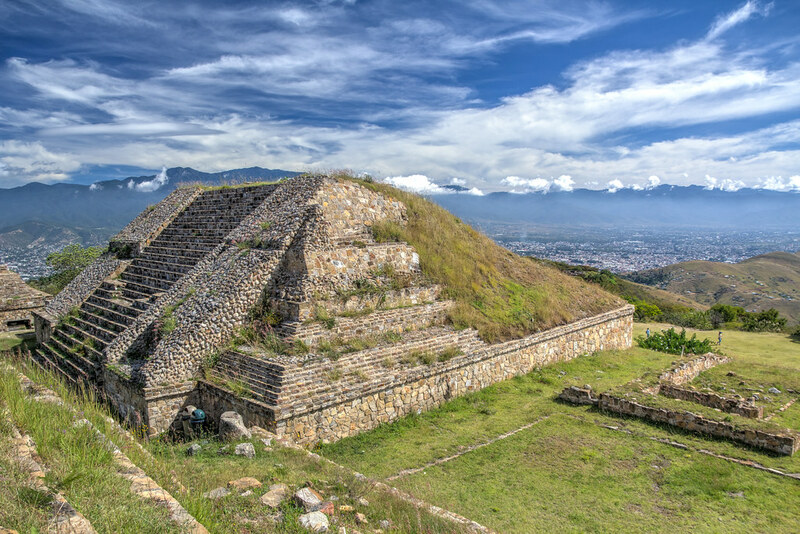 I was especially interested to see it, since Monte Albán was responsible in a roundabout way for my marriage. My last year of college, I took archaeology as an elective. The professor, Dr. William Middleton, gave us lots of interesting exercises and readings from his fieldwork at Monte Albán. A few years later I was done with school, with plenty of money and time to travel but no one to go with. I remembered like archaeology class, so I signed up for a field school in Kampsville, Illinois. Shortly after arriving I met my unit partner for the week, my future wife, Michelle. We spent a week working eight-hour shifts in a one-meter by two-meter hole, and the rest is history! Monte Albán is big! The main plaza and the dozens of temples around it are as big as some of the other Precolumbian sites I’ve been to, and they are only a small part of the whole. From the top of the hill, our guide showed us several other, still forest-covered hilltops that are also part of the greater Monte Albán complex and are still waiting to be excavated by future archaeologists. 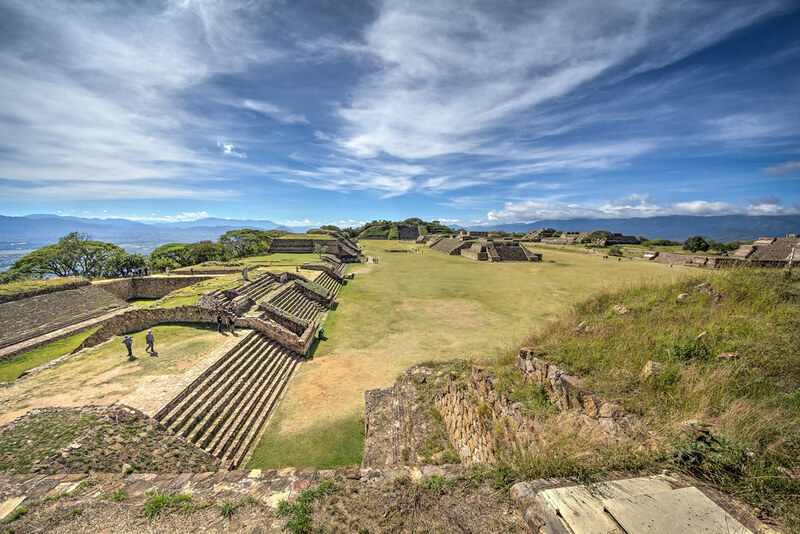 It was a clear, beautiful morning when we visited Monte Albán, with the sky incredibly blue and full of big fluffy clouds. The guides explained that the lower tiers of the hill were residential and the central plaza at the top was for temples and rituals. 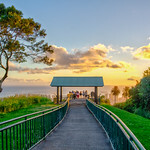 This platform straddles the edge between the two levels. We travelled around Mexico with a group from G Adventures, a Canadian company that I’ve used a couple of times in the past. They were fantastic, organized and committed to making sure we got lots out of the trip, and we made some great new friends! 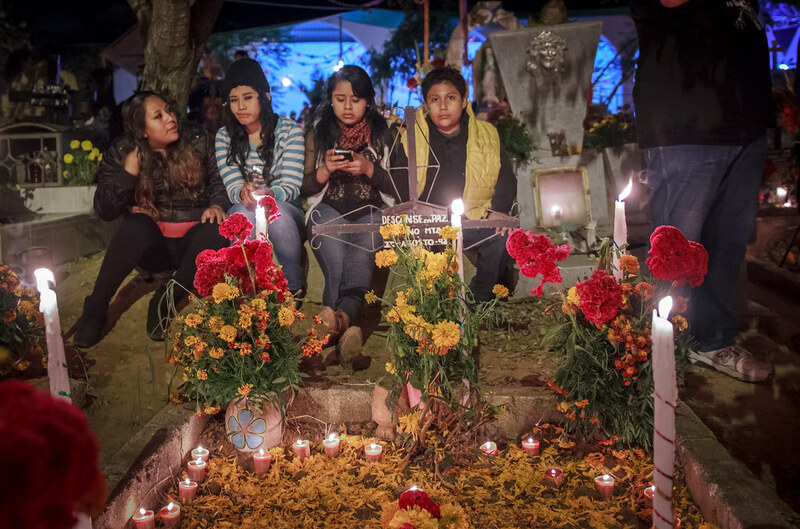 Later that night, we dressed up and headed for the cemeteries around Oaxaca to take part in the central ritual of Dia de los Muertos: the graveside vigil. 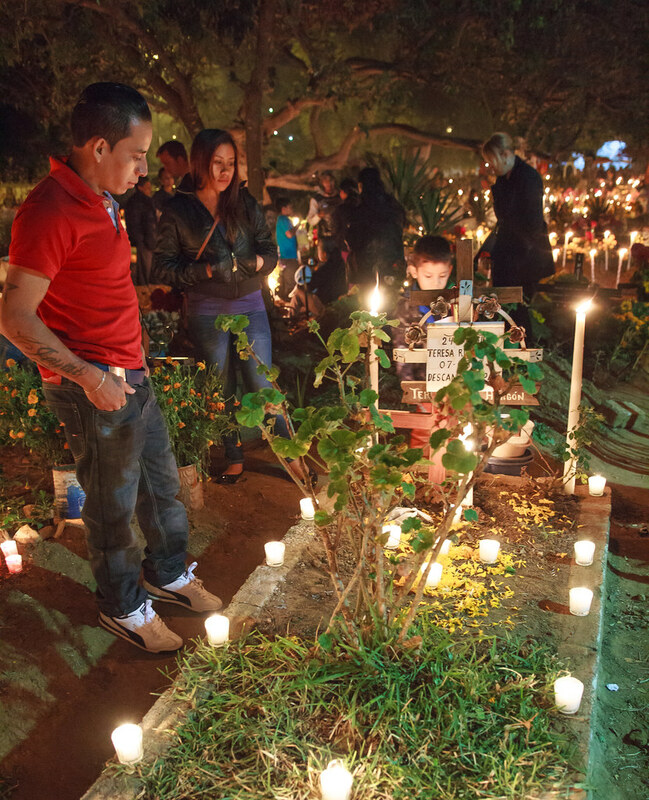 On the nights leading up to November 1, the people of Mexico return to the graveyards where their family members are buried. They sit around the graves (or in some cases, on the graves) and remember the dead. 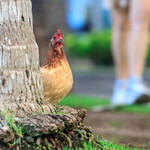 I wasn’t sure how to feel and how to behave around people at the cemeteries. We were told that it Dia de los Muertos wasn’t a sad day, but I observed all kinds of reactions. Some people were sad or upset; others stoic. Some looked bored, and others looked like they were having a great time. Every cemetery was crawling with celebrants and tourists, threading their way between the graves, stopping to take pictures, carrying plates of food. There was invariably a row of food trucks just outside the cemetery walls and bands and mariachis played on stages or roamed the graveyards, singing and playing their instruments. Many of the graves were decorated beautifully. Flowers, especially lilies and marigolds, were common, and all bore candles. Some were decorated with sand art, small figurines, and plastic flags. Pictures of the deceased were common, but they might have been there all year round. It was easy to spot the ones who were grieving: they stared silently at the graves, or off into space. Maybe their loss was recent; maybe they were mourning a beloved spouse or parent. When I asked if I could take a picture, they lowered their eyes or mumbled “no”. I felt the most for the people who were sitting graveside alone. Other people were clearly having fun: the atmosphere around some graves was more like a family reunion. 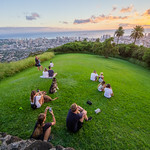 People laughed and joke and ate and told stories; we saw one family with a TV on a little table, hooked to a generator and showing a New York Mets game. And then there were the teenagers, for whom this was a boring yearly obligation. They sat sullenly, playing on their cellphones and waiting until they were excused to get some food and play carnival games. Seeing people celebrating Dia de los Muertos was something I’m glad I did, but eventually I started to feel awkward about what I was doing. Most of the people I talked to were gracious and happy to chat and have me snap a picture or two, but I got the sense they would be happier when I moved on. I felt like the annoying gringo who came to crash everyone’s party. The next night was much better as we marched in a Dia de Muertos parade and shared dances and drinks with a village full of happy people. I’m nearly finished processing the mountain of photos from Oaxaca! Most of them are up on Flickr now, here are a few more favorites from the second and third days of our trip, exploring Oaxaca’s markets, churches and craftspeople. 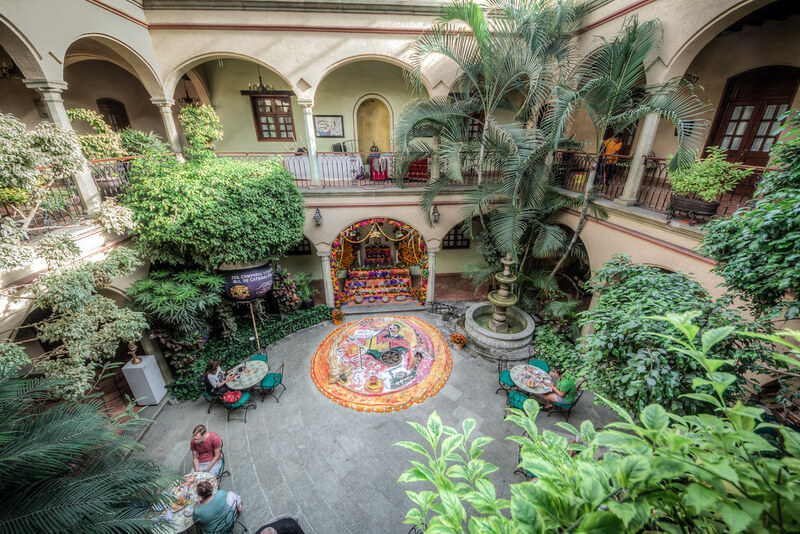 Hotel Casantica, just north of Oaxaca’s main square (zócalo), was our home base for the trip. It was pretty and clean and had decent amenities, and it was hopping the entire week we were there. I took this picture on the balcony overlooking the main courtyard. 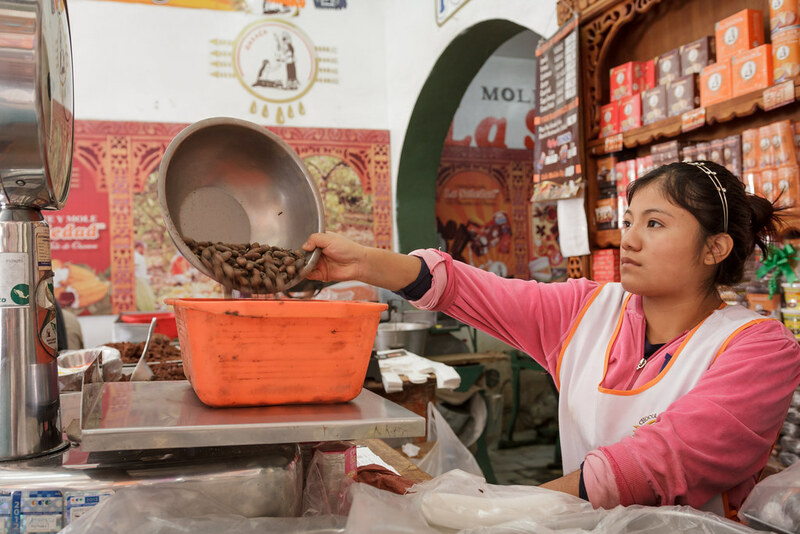 Aside from mole and indigenous culture and handicrafts and a dozen other things, Oaxaca is known for chocolate. Oaxacan chocolate is rustic and unrefined, high in sugar and pretty delicious as a cold drink. We visited this chocolate factory with our group one day and went back the next day to buy a few blocks of chocolate for home. We visited three churches in Oaxaca, including the cathedral, but my favorite was the Templo de Santo Domingo. 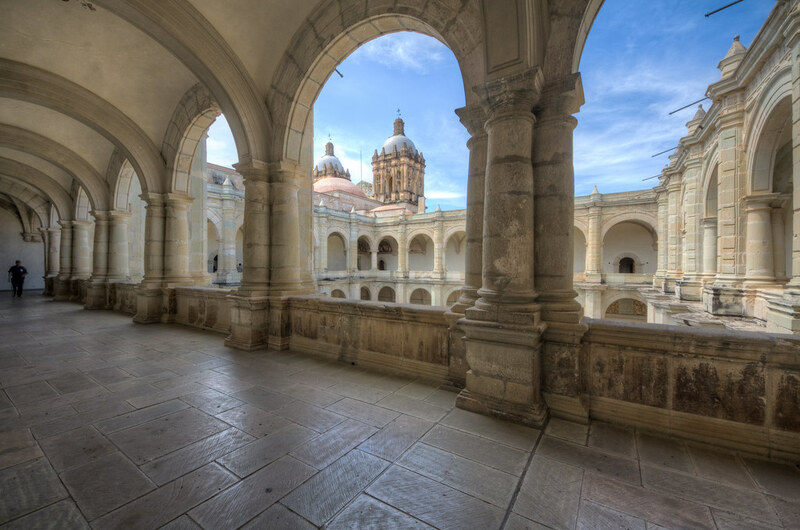 A former Dominican monastery set in am imposing plaza, the Santo Domingo church looked equal parts house of worship and fortress. The sprawling monastery had been turned into a museum, centered on this arcaded courtyard. 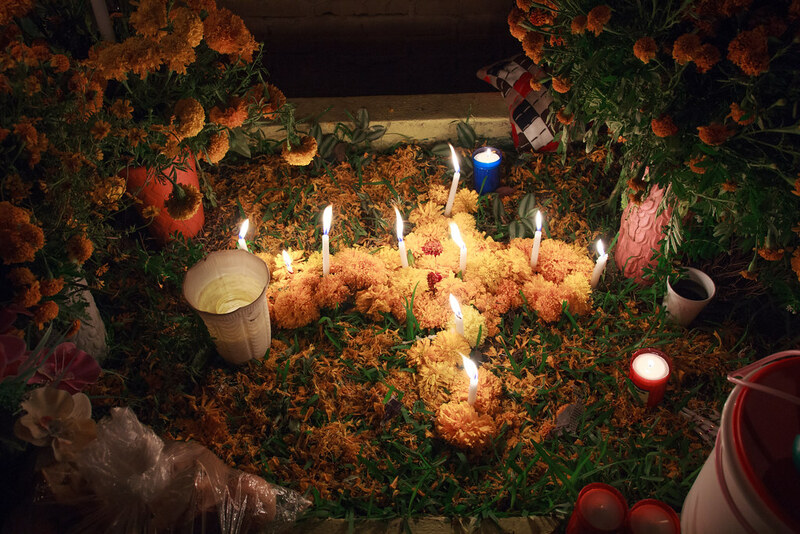 All around Oaxaca, Dia de Muertos parades continued all week. 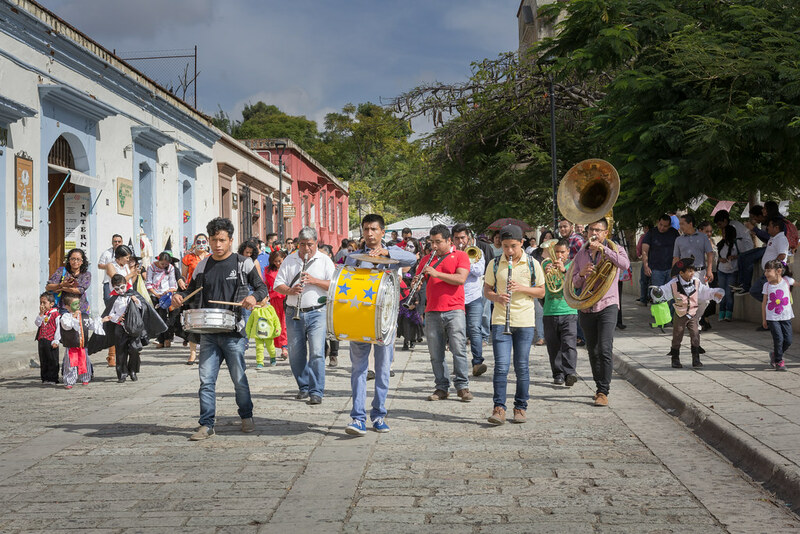 The Santo Domingo church was a place of special focus and we watched several parades set off, led by marching bands. I mentioned before that Oaxaca has managed to resist the American Halloween to a certain extent. 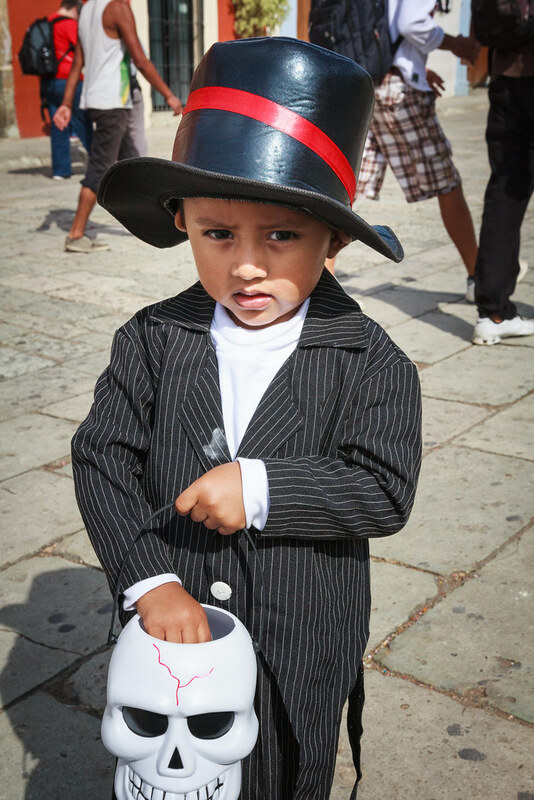 In Mexico (or at least Oaxaca), children marching in parades don’t ask for candy, they hand out candy to bystanders, even adult tourists frantically snapping pictures. After posing for a picture, this little boy reached into his pail and handed me something like Mexican smarties. 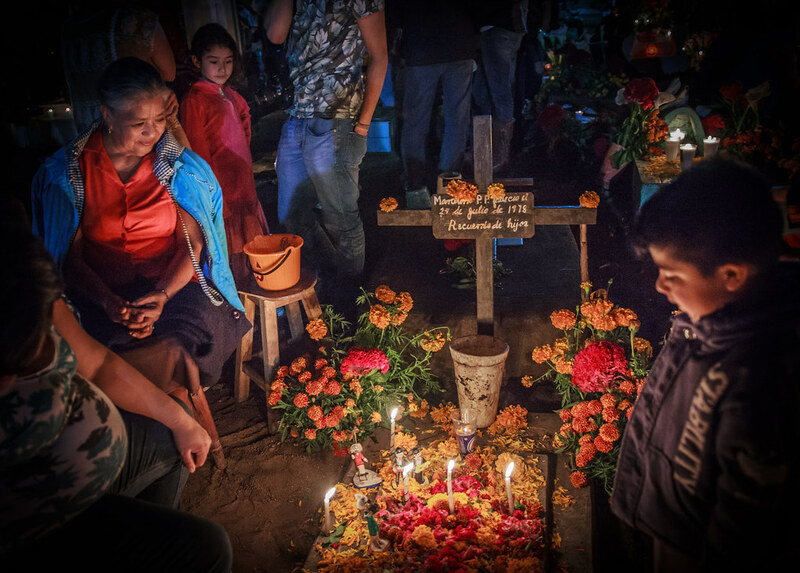 In the next installment we’ll visit prehispanic ruins and head to the villages around Oaxaca to observe and take part in the central part of Dia de los Muertos, the graveside vigil.